Less money and fewer bugs, but the same frustrations. Should you buy an HP Chromebook x2? 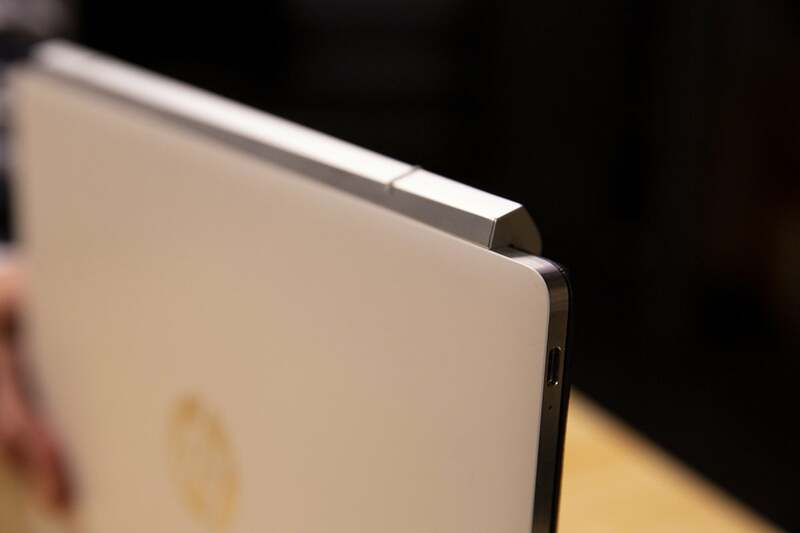 When the detachable HP Chromebook x2 was announced in April, it was ahead of its time. Android app support was still a fledgling ambition, Chromebook tablets weren’t really a thing yet, and its $600 price tag seemed astronomical for a heaping portion of uncertainty. That’s a big HP logo on the back. Eight months later (after shipping in the early fall), the HP Chromebook x2 makes more sense. 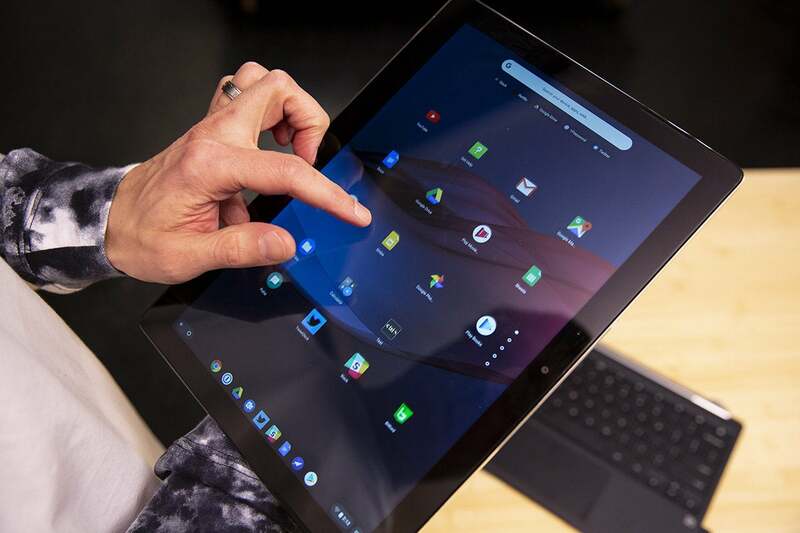 With the arrival of the Google Pixel Slate, Chrome OS has transformed into a full-on hybrid system, switching between a touch-based tablet interface and a PC-like keyboard-based one depending on how you’re using it. The Chromebook x2 is uniquely suited to take advantage of both formats, with a bundled keyboard and stylus. But just because the Chromebook x2 is ready for the future doesn’t mean it’s right for your workflow. 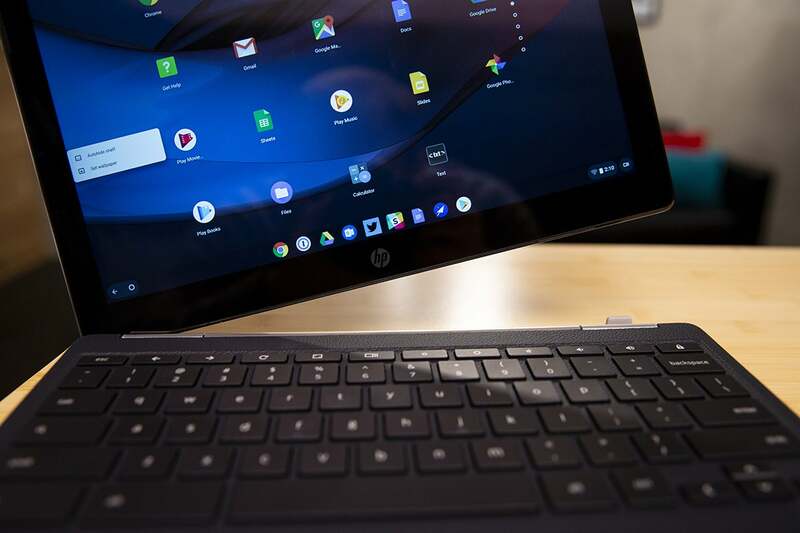 While it definitely has a few advantages over the Pixel Slate (including a lower price), it ultimately suffers from many of the same problems, mainly that Chrome OS still isn’t very good on a tablet. If you simply want a Chromebook there are better options, but if you’re in the market for a 2-in-1 Chrome tablet, the Chromebook x2 is easily your better option over the Pixel Slate. Despite offering a similar screen size as the Pixel Slate’s, the HP Chromebook x2 is quite different from Google’s tablet. For one, the bezels around the screen are noticeably wider, so the device is a bit larger all around. HP has used the extra room to put its logo on the front, which detracts from its orientation-agnostic aesthetic. The Chromebook x2 is about a millimeter thicker than the Pixel Slate, but its flat sides make it feel even thicker. 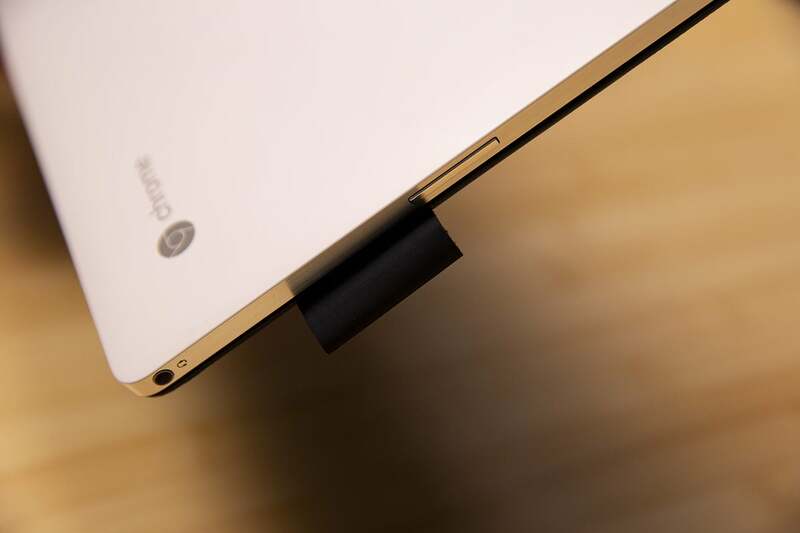 While that apparently wasn’t enough room to include a fingerprint sensor, we appreciate the headphone jack (missing on the Pixel Slate). The pair of Bang & Olufsen speakers that visibly jut into the left and right sides of the bezels sound fantastic. 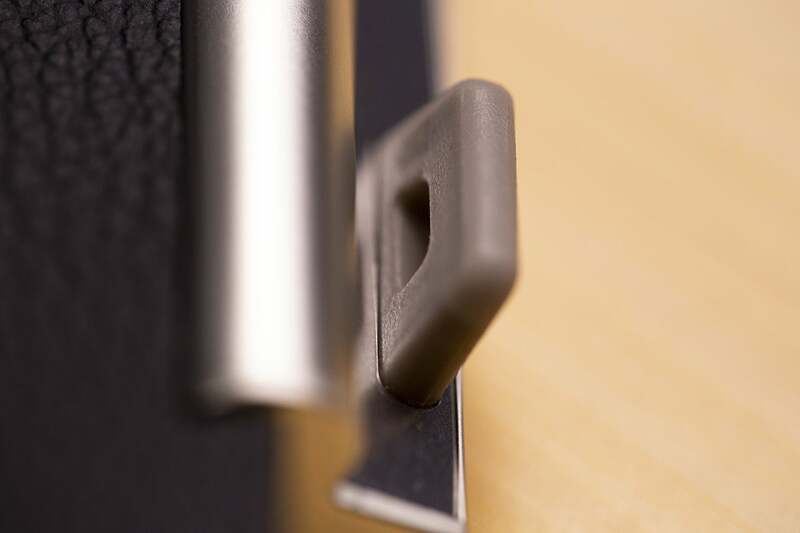 A hefty hinge on the keyboard ensures the Chromebook x2 won’t topple over. The nicest part of the Chromebook x2 is the tablet’s back, which is made of white matte ceramic and feels smooth and polished when held. Detracting from the minimalism, however, is, you guessed it, another giant HP logo. 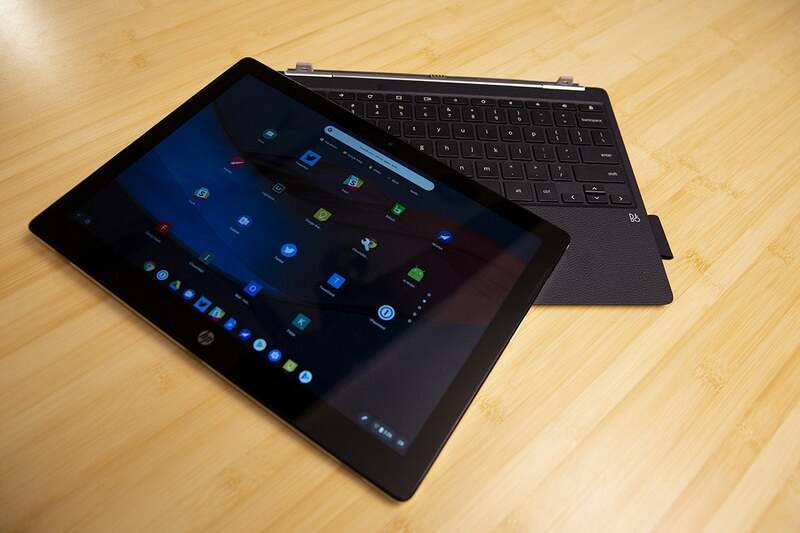 But while it might look good, the Chromebook x2 isn’t very comfortable to use as a tablet. Weighing 1.62 pounds means doing anything with the tablet that takes more than a few minutes would definitely cause some arm strain, as would raising it to use the cameras. Realistically, most of your work on the Chromebook x2 will be done using the keyboard base, which is kind of a mixed bag. On the one hand, HP has built a fantastic hinge that lets you use the Chromebook x2 like a bona-fide laptop, much like the Brydge keyboard for the Pixel Slate. Attaching it is super-easy, with pogo pins and a pair of support tabs. It feels sturdy when locked into place, and it works well on a table or a lap. The Chromebook x2 is a little too big to use comfortably as a tablet for very long. The trackpad is nice and large (though a bit too clicky for my tastes). While I wish the keys were backlighted, they have good responsiveness despite just 0.6mm of travel. 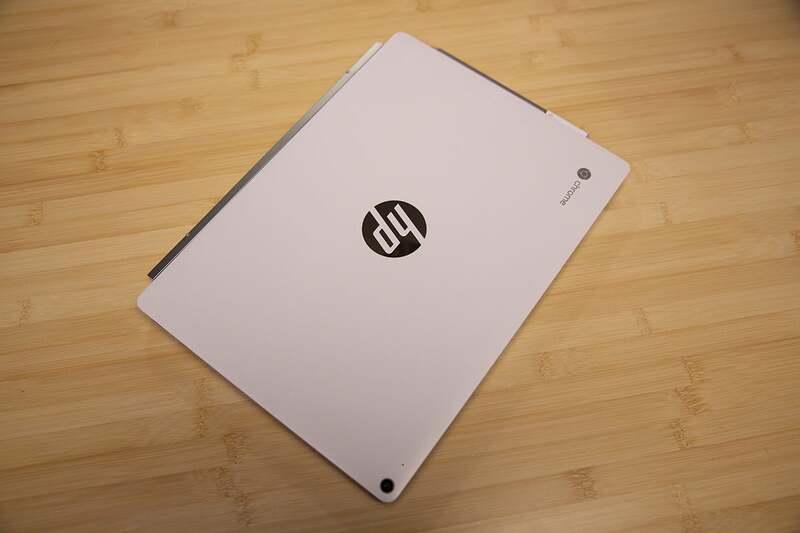 But even though it’s nearly as heavy (about 1.5 pounds) as the tablet it accompanies, HP’s keyboard feels somewhat flimsy. When the tablet extends steeply, the attached keyboard feels less stable. 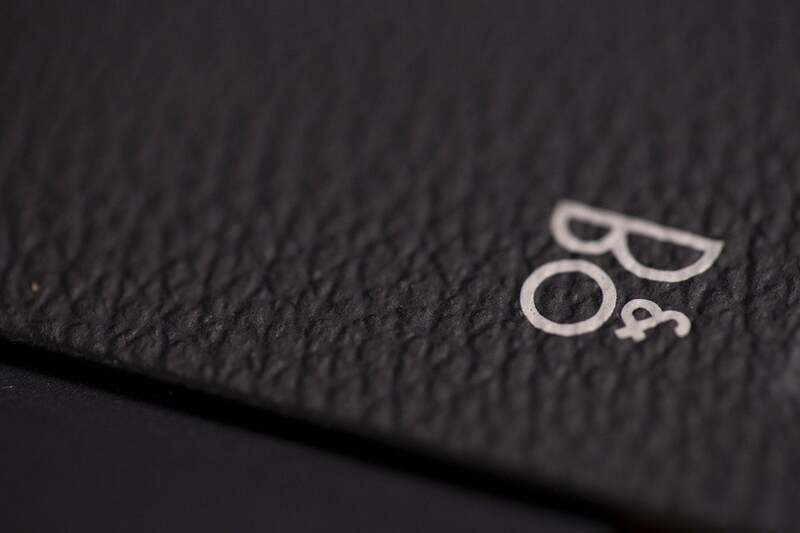 It also looks cheap, with a textured faux black-leather finish that’s somewhat reminiscent of a car dashboard. Finally, users may be aesthetically conflicted about the keyboard’s underside, painted Oxford Blue (as HP calls it), because it introduces a third major color to the design. The Chromebook x2’s bundled keyboard has two tabs that hold the screen in place. HP’s keyboard is certainly a step up from most third-party options for tablets, not to mention Google’s and Apple’s pricey folio cases. But the proprietary nature of the design pretty much ensures it will be the only way to type properly with your Chromebook x2. A Bluetooth keyboard would work in theory, but without a dock or something to prop the screen at an angle, it wouldn’t be very ergonomically friendly. That loop isn’t for carrying—it holds the bundled stylus. Along with the keyboard, the Chromebook x2 bundles a stylus powered by a AAAA battery. You can draw, write and navigate with it, but there aren’t any S-Pen-style tricks, nor does it have the pressure sensitivity of the HP Envy x2’s extra-cost Digital Pen. There’s a fabric loop for it on the side of the keyboard, a good, if inelegant solution. 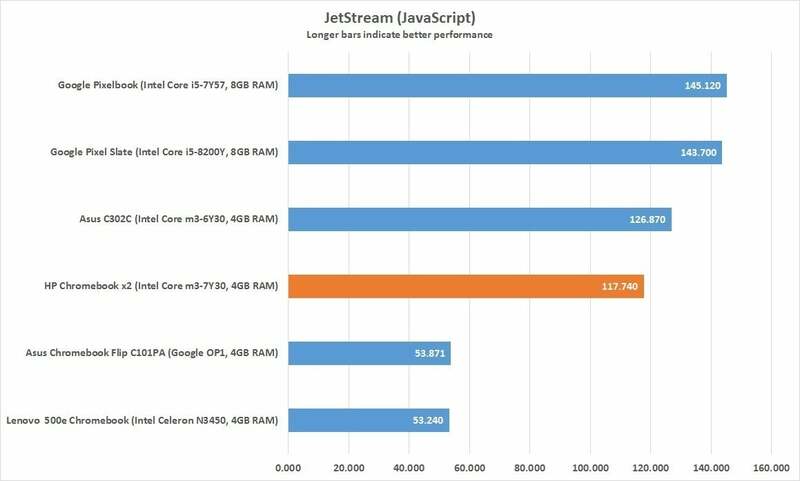 The HP Chromebook x2’s Core m3 chip kept up surprisingly well with the faster Core CPUs in the Pixelbook and Pixel Slate in mainstream tasks. Running the Cr-XPRT performance benchmark (above), which measures everyday tasks such as web browsing and video playback, the x2 was nearly as fast as a Core i5, and handily bested a Celeron Chromebook. 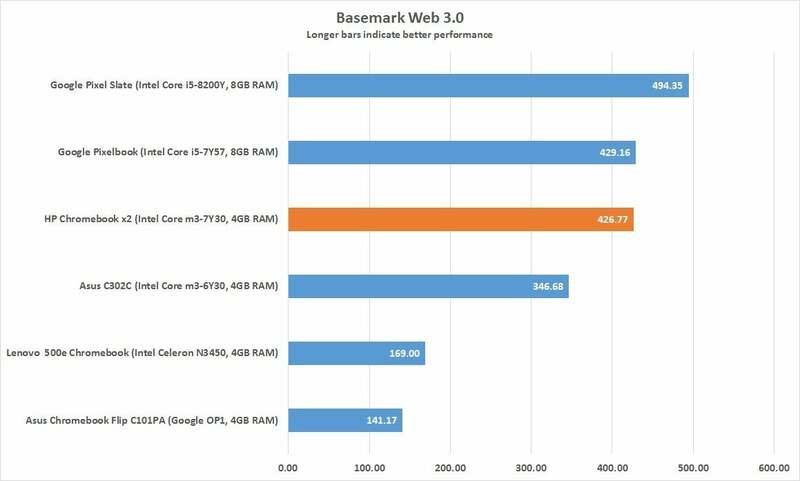 In the broad Basemark test, the HP Chromebook x2 once again kept up well with its pricier Google rivals. 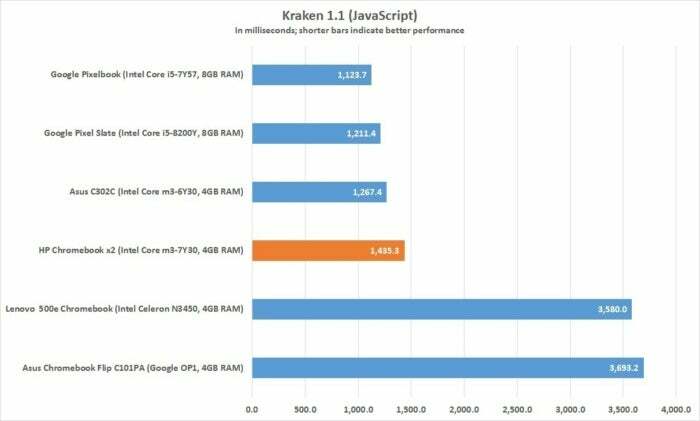 ...the result was about the same: The Chromebook x2 kept up pretty well with the Googles and lapped slower Celeron-based Chromebooks. 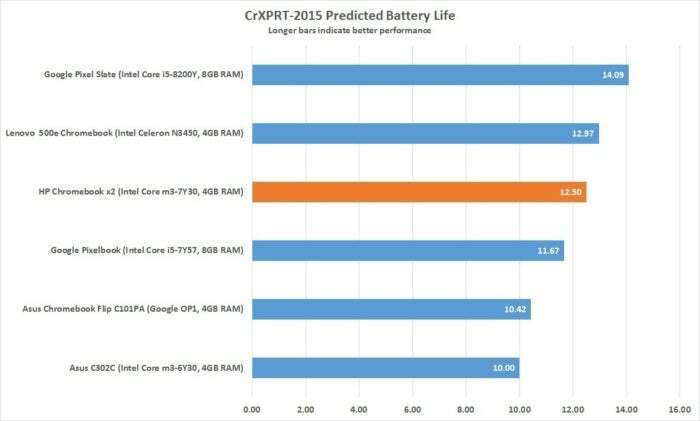 The HP Chromebook x2 has a projected battery life of 12.5 hours according to CrXPRT, jibing with our usage experience. Projected battery life (above) using Cr-XPRT was impressive as well. With brightness set to 200 nits (from a near-500-nit max) and medium volume, the x2 tested at 12.5 hours, making it one of the best models we’ve tested. While I was using it, I never had to worry about my proximity to an outlet, and benchmarks bore out my observations. 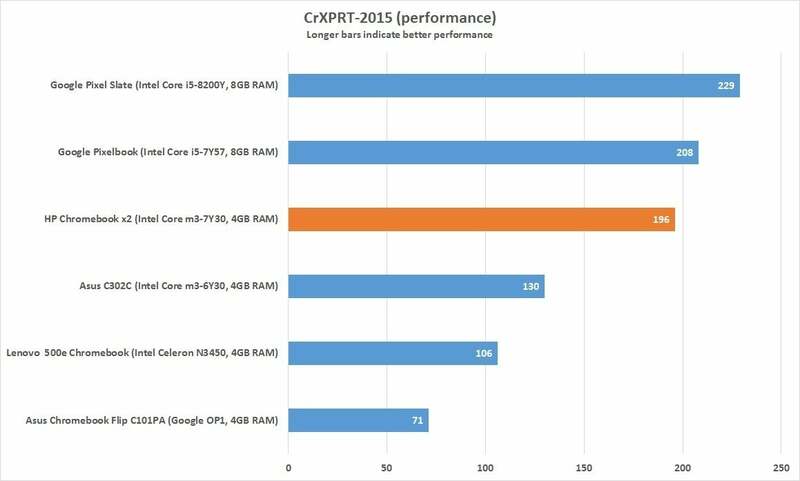 The Chromebook x2’s performance numbers tell a compelling story. It might not be quite as powerful as the Pixel Slate, but it keeps up surprisingly well. 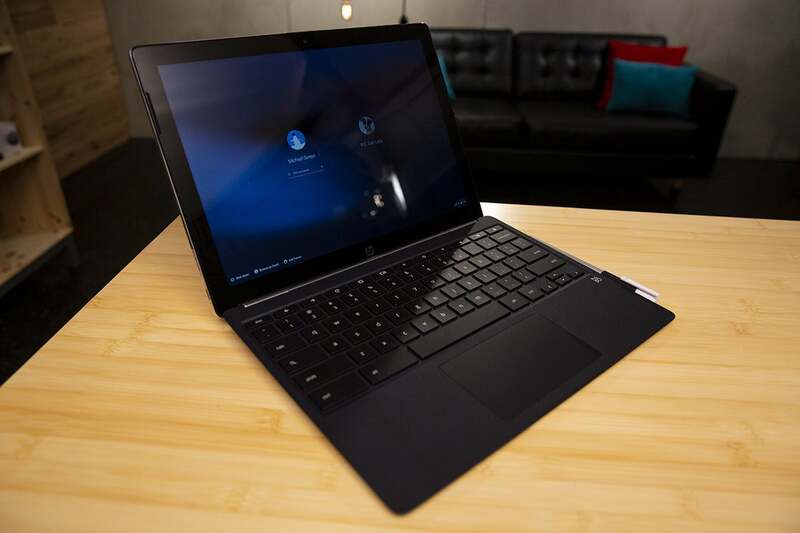 HP could have crammed a Core i5 into the x2 and jacked up the price by $200, but the m3 is a nice tradeoff. An option to upgrade to a better processor would be nice, but for the money, the Core m3 Chromebook x2 is just the right about of speed and power for the vast majority of buyers. The Chromebook x2 only recently adopted a true tablet interface with the Chrome 70 update, and I have the same problems with it here as I do with the Pixel Slate. Mainly, the two interfaces don’t gel as well as they should, and switching between them is clunkier than it is on other 2-in-1 devices, namely the iPad Pro and Surface Pro. The trouble begins when you detach the Chromebook x2 from its keyboard base. I had fewer problems with the Chromebook x2 than the Pixel Slate when it came to crashes and bugs, and Android apps ran as well as Chrome extensions. That could have something to do with the version number—the x2 is still running version 70, rather than version 71 on the Slate—or the simple fact that HP’s Chromebook has been on shelves longer, but whatever the case, the stability makes tablet mode feel more polished than it does on the Slate. With the clarity of a bug- and crash-free experience, I was able to get a better perspective on what’s wrong, what’s right, and what will hopefully be changed. Google has taken more than its share of cues from Android for Chrome’s tablet UI, including a back button, full-screen app presentation, and split-screen multitasking, and the interface works well enough in a vacuum. But when used alongside the classic Chromebook environment, the limitations of mobile are on full display, compounded by Google’s deliberate decisions to overlook or ignore the things that make Chrome so effortless. The HP Chromebook x2 looks and acts like a standard laptop with docked. Some changes need to be made before Chrome on a tablet can be taken seriously. The first change I’d make is to open the multitasking screen when switching to tablet mode. Going from floating windows to full-screen ones is a jarring transition. Jumping straight to the multitasking screen would better telegraph the interface changes. I’d also like to see Chrome adopt a version of Android Pie’s gesture navigation and picture-in-picture, two features that would be right at home on Chrome. The HP Chromebook x2 has its shortcomings, but compared to the pricier Pixel Slate, it’s by far the better bet and bargain. The HP Chromebook x2 sounds great thanks to a pair of Bang & Olufsen speakers. At $600, the Chromebook x2 certainly isn’t cheap, but it’s far more affordable than the Pixel Slate. The Core m3 version of the Pixel Slate has a newer 8th-generation processor, and twice as much RAM and storage as the Chromebook x2, but it costs $200 more—and that’s without a keyboard a stylus. Add those things and you’re looking at nearly $1,100. To match the Chromebook x2 in pricing, you need to go all the way down to the slowest Celeron configuration of Pixel Slate, but again, that’s without a keyboard and pen. Beyond the price, the Chromebook x2 simply offers a better all-around experience than the Pixel Slate. That may change in future OS updates, but for now, if you want a 2-in-1 Chromebook, the x2 is the one to buy. The HP Chromebook x2 is the best detachable Chrome tablet you can buy, but you might be better off buying a straight Chrome laptop instead.